With the government’s fiscal year ending and industry analysts forecasting a reduction in government information technology spending in fiscal 2007, agencies are spending what remains of their fiscal 2006 IT budgets more judiciously than in years past. But for many vendors, it’s business as usual. Vajda said he is unaware of any special vendor promotions or discounts. “By law, [vendors] are supposed to be giving us their lowest price already.” If they’re discounting beyond their posted prices, he said, they could be violating the law. Carlson said agencies are not waiting until September to start shopping, and they’re spending more year-end dollars on training programs and additional copies of software they are already using. For example, Red Hat reported brisk sales of its operating system training programs. The company’s annual year-end discounts might have helped, said Mike Byrd, director of government channel sales at Red Hat Linux. “Every year we do try to do something special for the federal fiscal year end,” he said. Increasingly, however, the year-end rush to buy is ebbing. Carlson said agencies that once gave little thought to their year-end purchasing until the last moment are now assessing what they need much earlier. “I don’t see the panic I saw in years past,” she said. The major service commands have budget restrictions and procurement guidelines that regulate how their funds are spent, LaForgia said. For example, deadlines on purchase orders make the procurement process more orderly. Military purchasing may be a little slower than last year because of Defense Department restrictions, she added. Katherine Valltos is a chief acquisition manager at GovWorks, the Interior Department’s Federal Acquisition Center that helps agencies with buying. 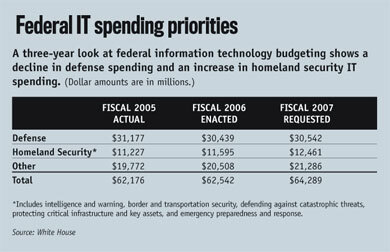 She said that despite cuts in some DOD programs, spending for war-related technology remains high. 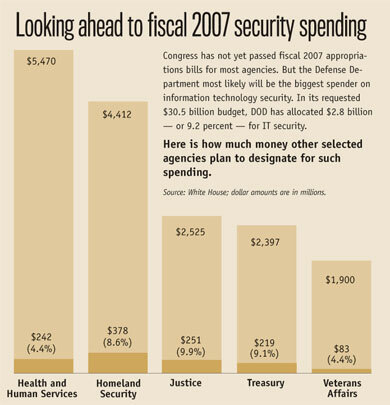 DOD clients account for almost 70 percent of GovWorks’ acquisition activity. “We’ve seen a significant increase in procurement activity over the last month,” Valltos said. Indeed, agency-imposed controls and governmentwide regulations appear to have helped rather than hindered year-end buying activities by homing in on best buys and good deals. In their pursuit of good deals, Byrd said, the intelligence community and the Commerce Department’s National Oceanic and Atmospheric Administration are among the biggest buyers of Red Hat’s Linux OS training programs, Success Pack and Blended Learning, which can lead to Red Hat certification for systems administrators. Both programs are sold through Red Hat’s distributor, DLT Solutions, at discounts of 10 percent to 20 percent, Byrd said. The company offers an additional 10 percent discount for purchasing Blended Learning’s in-classroom training and e-learning module, he said. Others have deals, too. “We’re always busy at the end of the fiscal year” because the feds are major year-round buyers of Dell laptop and desktop computers and accessories, said Troy West, vice president and general manager of Dell’s federal segment. Randy Zewe, regional manager for the government channel at Sun Microsystems Federal, said he has seen sales activity increase significantly in the past couple of weeks. “We’re seeing a pretty strong pipeline in our business,” he said. Zewe said Sun’s 73 government resellers are selling products on contracts such as NASA’s Scientific and Engineering Workstation Procurement, the Army’s IT Enterprise Solutions-2 Services contract and the Air Force’s Network Centric Solutions contract and on blanket purchase agreements. “We feel we’ll be able to take advantage of all the IT infrastructure requirements that the government year end is going to offer us,” he said. To boost sales, Sun is running several promotions, including a double trade-in offer that could be worth up to 20 percent on Sun’s UltraSPARC II server and a free rack with the purchase of four or more Sunfire X4500 or X5600 servers. For one small vendor who is experiencing the year-end market for the first time, sales have been good. Mike Kieran, director of sales and marketing at MXI Security, a division of Memory Experts International based in Montreal, said the company launched its portable security storage and mobile identity devices Stealth MXP and Outbacker last November. Kieran said government sales are outstripping commercial buys, and he cited defense and homeland security agencies, DOE, the Social Security Administration and the Federal Aviation Administration as his leading customers. “We’re noticing a significant amount of incoming queries on the devices,” he said. He attributed that to MXI’s information campaign of e-mail messages, fliers and phone calls.